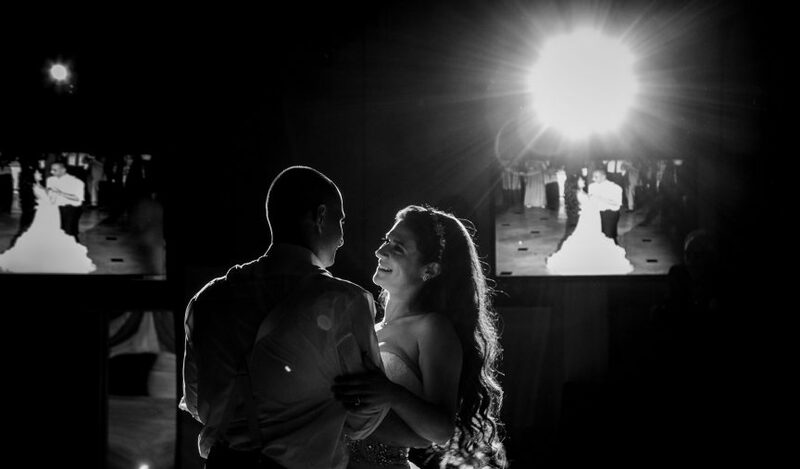 Couples sometimes ask us “How can a Video Montage for my Wedding Reception make it memorable?” By telling your story, sharing snap shots or zaps of the reception, displaying your ceremony as a same day edit, and incorporating high energy ambient visuals during dance sets. All of these ideas will add a special touch and moment to your reception. All of these video and photo options will be given to the couple on disc or USB drive after the reception. Gather cherished photos to create a memorable life video montage sharing past memories with family and friends. The different segments of each of you and together are choreographed to songs you choose. They then are displayed during dinner at the reception. We found presenting it at that time prevents any unnecessary down time. Add to that dance with mom, dad, or special someone as wonderful memories scroll by on the screens. Create a touching and emotional tribute montage for a special someone who is no longer with us. When presented properly, this adds an amazing touch for family and friends. Zap photographers capture candid shots of guests dancing, socializing, and partying. They are then put into a slideshow that is displayed on the screens for all to see and enjoy. These slideshows are shown during the serving of your food courses so that we don’t lose any dance time. Visual Ambient Effects on the displays tied into the music and lighting. The result is additional energy & mood to the dance floor and ballroom. Another effect is to elegantly spread engagement shoot photos or ceremony highlight pictures across 2 or 3 displays for an amazing & breathtaking visual effect. This wide screen presentation can be used as your guests enter the ballroom, during your first dance, during cake cutting, etc… When properly presented, this unique touch is one of the most talked about options we offer. Capture & share same day highlights of your ceremony via a 3-5 minute video clip on the screens at the reception. This usually is presented as a lead into your cake cutting. Video clips of getting ready at their homes, the I Do’s at your ceremony, being introduced into the ballroom, first dance, etc… These clips will be professionally edited to a high impact “Best Of” for all your guests to cherish. You will receive a copy of this same day edit on a disc or USB drive to be shared on social media.